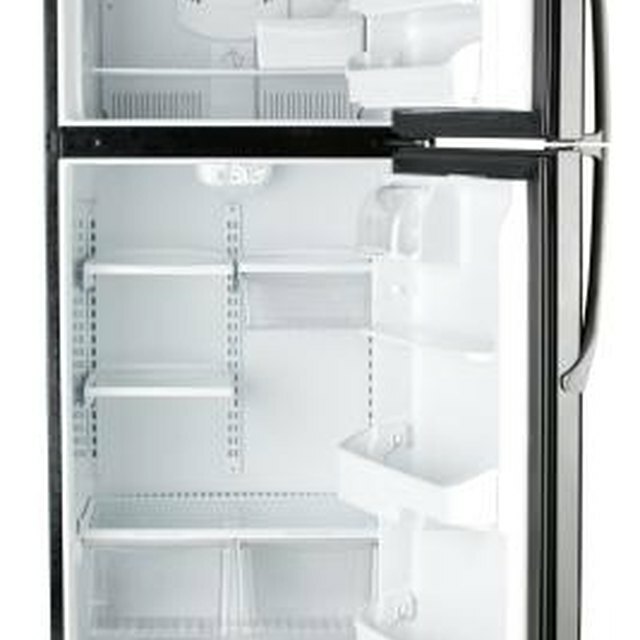 Many Frigidaire refrigerators and freezers come equipped with a ice maker built into the appliance. These ice makers will dispense water and ice cubes within 24 hours of the appliance being hooked up to the main water line. However, there are times when, for whatever reason, the ice dispenser won’t dispense the ice. But don’t worry, there are ways to determine what's wrong so you can fix the problem. Frigidaire refrigerators and freezers with built-in ice dispensers are unable to dispense clumps of ice. When the ice unfreezes and then freezes again -- after a power outage, for example -- the ice often clumps together. If you suspect that this is the problem, then go in and break up the ice in the tray. It's also a good idea to remove ice from the tray every few days. Ice may clump together due to the freezer not being cold enough, so the ice melts slightly causing the clumping. Check the freezer’s temperature controls and lower the temperature if necessary. Sometimes the motor will become overloaded when the ice dispensing arm is held in for too long and this stops the ice from dispensing. This is usually the case when it is held in for more than five minutes. Let the motor rest for several minutes; the overload protector resets itself after three minutes. The dispenser should then drop ice as normal. The ice dispenser chute often freezes up if ice get stuck or backed up against the chute opening. This can happen when someone presses the lever to dispense ice but let’s go before the ice exits the chute. Open the freezer door and use a wooden spoon or another utensil to move the ice away from the cute opening. But you shouldn’t use any metal utensils since that could damage the chute. Other possibilities include the ice storage container being empty or nearly empty or the water line valve connected to the freezer isn’t open. After being turned on and plugged in, the ice maker requires 24 hours to start making enough ice for the dispenser to work. Check to make sure the water line valve is open. Always make sure the freezer door is closed completely, or the ice won't dispense properly.